How much money do you have in your pocket or wallet right now? I know many of us don't carry much cash these days, but for a child living in extreme poverty, just $1.25 per day goes a long way. Some people are so overwhelmed with the thought of poverty and need in the world that they get stuck there and don't/won't do anything about it. And that is a shame! We live in the richest country in the world. There are choices we can make each day that allow us to put aside just $1.25 per day, so that each month we can sponsor a child living in another country who needs to hear about Jesus. You don't even have to leave your home to spread the Gospel! And the Gospel will spread if you take that step to sponsor a child today. The child you sponsor will hear about Jesus when they attend the child development center in their area. That child will tell his/her family about Jesus. So not only are you making an impact on one child, you are making an impact on an entire family! Yes, you! Sitting in your home here in the United States, without even leaving your hometown, can make an impact on an entire family! 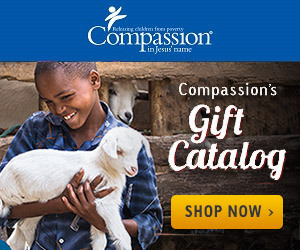 Still not sure if you can afford to sponsor a child? I issue you this challenge then: 1. set out a jar to collect your spare change for the month; 2. at the end of the month, count up your spare change; 3. do you have at least $38 in spare change? If the answer is yes, sponsor a child! If the answer is no, donate what you have collected to Compassion's unsponsored child fund.